Have you ever had that heart-sinking feeling when an appliance makes a noise you’ve never heard before? An alarm sounds and all you can think of is how much it’s going to cost you to call an engineer out to fix it. This happened to me a couple of evenings ago. I have an Electrolux integrated dishwasher, model ESL 4200LO. It’s only just out of warranty, typical! I checked the machine out and found that the empty pump was running constantly, even when I opened the door, usually everything stops at this point, but it didn’t. The alarm was beeping 3 times intermittently along with a flashing “end of cycle” LED. The only way I could get everything to stop was to turn off the power, not the ideal situation. I checked the manual to see what the alarm meant and it turns out that the Anti-Flood device had been activated. This activates if the machine detects a leak, handy to know that your kitchen won’t be flooded if something goes wrong. So how to fix it? With the help off Google and some common sense I managed to do it and it was surprisingly easy. Why am I writing this post if it’s easy and you can find the information online? I found the information from lots of sources, there was no one site that told me the full story and definitely none with pictures. Please make sure the power is switched off for this method, we don’t want any accidents. 1 – Remove the kickback (this is the narrow piece of wood found below your cupboard doors that hides the area under the kitchen cupboards). 2 – Use a screwdriver to remove the screws that hold the lower cover in place on the base of your dishwasher. It’s a little awkward but doable. You can see the water and also towards the back you can see the anti-flood device activation switch. It’s the white polystyrene float that’s in the water. This is what has floated in the water and activated the empty pump. 4 – Get a small sponge or cloth and empty the water from the reservoir into a bucket. This may take some time as you can only do a little bit at a time but it will work. 6 – Now reattach the cover with the screws and replace the kickback. Your dishwasher should now work as normal. If not then you’ll unfortunately have to contact an engineer to fix the issue. I fixed mine last night so I am hoping it’s either a one off job or something I have to do yearly. If it’s something I have to do any more often than every quarter then I think I have a proper leak. Please note, this way worked for me. I can’t accept any responsibility it doesn’t work for you or if your dishwasher is broken as a result. This is done so at your own risk. Let me know how you got on, feel free to comment as I always reply. This entry was posted in How-Tos and tagged alarm, anti-flood device, dishwasher, Fix, handy, how to, switch. Bookmark the permalink. Thank you! I live just down the road in Farnborough and my Electrolux dishwasher broke on Saturday exactly the same thing, followed your instructions and hey presto working again. Ironically mine was 1 month out of the the 2 year warranty. Great detailed instructions, same as you i’m waiting to see if its a proper leak. just the boiler now but that wont be a diy job! Guys, thanks a lot for all the explanations; it lead me to try a faster ans simpler fix for that very same issue ! If the floater is floating while there’s no water and the pump is running empty, then the floater is stuck somewhere and I’m gonna try to push it up to make it go down. So I emptied a large bucket of water in the dishwasher until it starts spilling, then closed the door 3/4 and added some more water…then I closed it, ready to go on ECO cycle…and thanks Archimede, it worked. Spot on worked a treat very simple fix took about 15mins soaking up water with sponges and kitchen towel and resetting float. Waited through cycle after switching back on no further water leak. Hey, thanks for the comment, I’m glad it worked for you! Wow! Just followed the instructions posted here after the dreaded beeping last night and this am and it appears to be fixed. Always wondered if I would ever find a use for those old Disney towels. This screw is to adjust the back positioning leg that the dishwasher stands on, it’s not to drain water. Thank you so much – this advice worked like a dream! Money is so tight and this dishwasher issue had added to my worries. Hi Mark 21/8/2018. same problem just happened when we got the extended family staying. Read your blog and Hey Presto , all working good . Thank you, buddy. you save me my money. Greetings from Serbia…. Just wanted to say a quick thank you for this article! helped me sort out my dishwasher! I followed your steps and had the same thing,I cleaned the water it stopped the sound and when I started the dishwasher,water was leaking after a while from the two plastic black tubes above the float device…I’ll have to find the technician to fix it.It is something from inside.but well done and thank you for the info,you are the only one who found how to stop the alarm. Just for reference, I had the exact same problem with my ESL5310lo dishwasher. Followed the same steps, remove the lower front plate, clean the tray of water using kitchen towels, and the machine was back in operating condition. Then ran the machine without front plate on the maximum temperature setting, to see if anything leaked. Everything stayed dry, the water must’ve accumulated over a longer period. Note for others: the front plate does give some structural stability to the machine (keeping the bottom plastic plate in shape), so it’s not wise to leave it off for too long, but it’s apparently OK to run just one program with the plate removed, to be able to verify there are no structural leaks in any of the equipment. Thanks, it worked. You are my hero! there should be more people like you in the world. Thanks bro, i follow your instruction and now dishwasher working properly ! Wow, you’ve made my day! Works like a charm :)! Thanks a million! This worked perfectly on my Electrolux esl6610ro Many Thanks!! I can think of better things to do on a Saturday night, but Thank You very much for your advice, I followed your instructions and it’s worked, and mine too is 1 month out of the 2 year warranty. Have never had this problem with with a BOSCH. Haha we’ll both be getting a Bosch next time! Glad it helped you. Great photos that really helped. 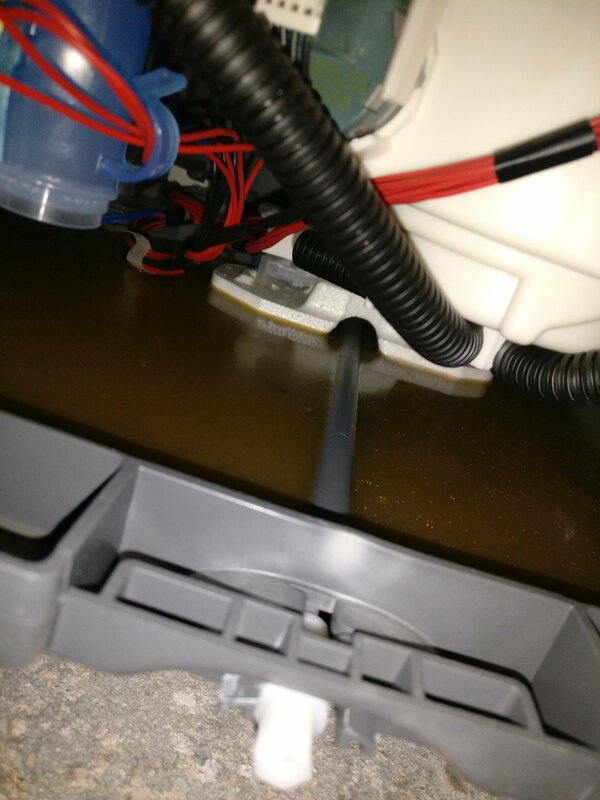 Once the water was removed from the drip tray the Micro switch float fell down flush back onto the drip tray. Just a little addition maybe its an idea to run the machine and observe if there are any leaks in the pipes and hoses with the metal cover removed.. In my case it was a blocked filter causing the water to run through the overflow into the drip tray. Thanks ! I spent more time on the internet to find your great advice than time spent by fixing it. Thank you very much, it helped a bunch. The problem wasn’t the fact it was filled, but the problem was a hose which was unconnected. Basically pouring water into the dishwasher I discovered all of it was running directly to the resevoir, nearby the hole was an hose with clamp attached in the end, simply reattached the pipe, cleaned the resevoir and reconnected the dishwasher. Great instructions, followed to a tee and dishwasher working! Thank you. I couldn’t believe looking at the replies how many times this problem had occurred and how many times your fix Mark has saved the day. Last night I had the same problem, dishwasher full of pots and all I could hear was a constant intermittent bleep and the panel displaying the end cycle. The thing that seemed strange was when I opened the door it didn’t stop anything and all I could hear was the drain pump constantly running. I googled as you do looking for a solution, I came across your solution, read the thread and thought ok it’s a job for the morning, isolated the dishwasher from the mains and went to bed. I am absolutely so pleased with myself after spending 30 min following your instructions this morning, substituted the cloth for a wet n dry vacuum and sucked up the water. Reset the float to lie flat and guess what 100% success. I couldn’t see any leaks or probably understand where the water came from in the first place but I had fixed it and still have my Sunday to myself. Thanks. Worked a treat on my neue (Electrolux by a different name). What a stupid design though. The Miele I had in my old house was much easier to do and didn’t involve takin it apart. Thanks very much. Exactly what was wrong with mine. Would you know of the cause of this before I put on my next wash? Glad it worked! I think it’s caused when liquids are poured into the dishwasher before it’s turned on. Thanks Mark. I’ll try and avoid doing that. Will put on another wash in the morning so I can keep an eye on it. Keep you and everyone posted. Just followed your excellent advice, it was full of dirty water… machine is now giving me a single beep and end of cycle light though (instead of the previous three beeps)….. any ideas? Glad to hear it sorted one of the errors on your dishwasher! The appliance does not fill with water. • The end indicator flashes 1 time intermittently. • Acoustic signal sounds 1 time intermittently. • Make sure that the water tap is open. • Make sure that the pressure of the water supply is not too low. For this information, contact your local water authority. • Make sure that the water tap is not clogged. • Make sure that the filter in the inlet hose is not clogged. • Make sure that the inlet hose has no kinks or bends. It’s beeping three times again now and there is water back in the reservoir… I could cry!! Haha. Perhaps there is a leak? Should I call an engineer? I thought I was doing so well with your massive help. Oh no! Yes I think that may be a good idea, just to be safe. Sorry I couldn’t help you on this occasion. Hi Kate, I have exactly the same problem. It beeps once so I turn the power off at the wall for a couple of minutes, then restart the programme. It then beeps 3 times, so I drain underneath as Mark says and restart the programme, it then works fine. I have to go through this routine every time I use the dishwasher! Mine is an Aeg Favorit 34502VIO. Thanks. Googled it seen it might be anti flood. Googled that. And this comes up. Worked a treat. Wasnt much water in it but none the less. Dishes been cleaned as I type happy days. Brilliant – So far so good. I thought I was going to buy a new dishwasher but this seems to have solved the problem. Thank you so much!! Just to follow up that after 5 full washes my collection area is completely dry. Oh! I should add that this was for an Electrolux ESF 45010 model, so the error code (The end of program green led flashes 3 times with appr. 3 secs intervals between while the drain pump keeps running) applies to that model too. BR and happy new year from Sweden. Worked a treat thanks very much! Worked perfectly for me. Clear and concise. This has happened before but got an engineer out as machine had an extended warranty. Saved waiting a week for a call out (hate washing dishes!!) lesson learned…… always clean out the filters. Bizarrely there were Christmas tree needles in mine. Mmmmmm……. Hi Mark, first off great piece of advice re anti flood device. Good to see lots of people where helped out by this advice. I am currently dealing with mother in laws Electrolux ESL7220 which has started out with a kinked drain hose fault then went on to the anti flood tripping. My question is about the two drain hoses that pass unwanted water into the reservoir from inside of the machine. If this is caused by excess fluid in the machine before starting then why does it not drain out the fluid used during the wash cycle. P.S. Manually tripping the flood device is also a good way of emptying the machine if you have to stop the machine mid cycle to empty it out. Just be extra careful as the machine is still live!! Keep up the good work. So glad we found you! Our dishwasher (again, typically out of warranty now too) did the whole beeping / pump running thing tonight (couldn’t figure out where the beeping was coming from at first!) and had a mini panic. Luckily, my OH was the sane one, told me to google it and we came across your how to. Thank you! He’s currently just (trying with some swearing) to put the plate back on. Our kitchen is now mercifully quote and now steam free again. Just done it and it worked!!!! Happened just over a year ago and we called and engineer out. Won’t be doing that again! Thanks! Great! Glad it saved you the hassle of getting an engineer out. Hello. Many thanks for taking the time to write and publish this. Was woken up by the running pump and beeps in the middle of the night. Followed your instructions and had it all sorted out in no time. Used a calpol pippette to get the water out. Here’s hoping it’s another 3 years until I have to do this again! Hi Mark, you made my day. Thanks a lot for your help! Thank you for the detailed instructions. We tried them but alas pretty much as soon as we turned the machine back on, the dreaded three beeps sounded and the tray again filled with water. Decided not to bother with an engineer and bought a replacement – but not Electrolux! One thing we did which may help others to speed up the removal of the water – we used a turkey baster rather than cloths/sponges/kitchen roll. This made the process quite a bit quicker although obviously it has to be an appropriate size to fit the gap. Thank you, all sorted! A bit of a design flaw I would say as I’ve never experienced this with any other dishwasher but happy it’s sorted and saved me calling out an engineer along with the call out charge… Happy days! Thank you SO much… this has just saved my skin and my dishwasher is working again!!!! Thanks mark, worked for me on an ikea enastende dishwasher. One note of caution – on that model when you remove the screwed on panel at the front the tray full of water can drop, so put something under it first! Thanks Mark, managed not only to solve the dishwasher problem with your guidance but (having shamelessly passed the idea off as my own) now the girlfriend thinks I’m a mechanical genius! Well that took all of 15 minutes! Great post. Cheers. Great stuff, thanks! It was a 15min fix & saved my a lot of ££ on the plumber who would do the same. Great piece of advice, really. We actually had a jam (water not leaving quickly enough), but i was able to fix that (but that’s probably the reason why the water got in the wrong place in the first place). After fixing the jam the machine (Electrolux ESL4575RO) didn’t start, it only beeped and pumped and flahed its red light as insane. I was already about to give a call to the engineer, but then i found your post (with great pictures!). I gave it a second thought and came to a conclusion i should try this at home before the call. And you know what, it worked! Thank you very much for your post! It was 10 minutes work, despite call to engineer and wait who know how many days! Same problem here,but but following your instructions we were in tip-top shape in no time. Thanks a lot! Thank you very much!!! Perfect instructions… job done in 10 mins!! Brilliant thank you very much indeed. One happy wife and some brownie points in the bag and no call out charge. Thank you, thank you, thank you! Thanks for writing about this. I followed the procedure and noticed water dripping from the transparent water assembly to the left of the machine during a wash cycle. This kept tripping the anti-flood alarm. I resorted to removing the external left hand panel of the machine and located the leak. It was eminating from the ‘Small PCB Cup container’ (see this link: https://www.espares.co.uk/product/es1736046/dishwasher-small-pcb-cup-container?pageNumber=1&PartTypeId=1978&ModelId=576708). This is held in place by an internal fixing which is located on the inside (wash area) of the machine. I believe it’s called a vapour outlet. It was actually this part that was loose. After significant tightening the machine now appears to be watertight. I would strongly suggest that if you have a similar leak in your machine you should tighten this part first as it will save you hours of dismantling your machine. We’re keeping our fingers crossed that this fixed the issue. Thanks, did this a while ago but used this post for reference to do so again, and it’s working again now. Last time the ‘flooding’ was caused by the waste pipe not being efficiently placed, so waste water from the sink was going back into the dishwasher. I rearranged the pipe so it would need to go against gravity to do that again, and it’s been working for months. Last night I got the dreaded 3 beeps again, so soaked up all the water and back to normal. Just need to check it in a few days to see if there’s anything else causing the leak this time. You are a rock star! Thanks for the post. This is absolute genius! Thank you so much for sharing your knowledge. Thank you a million times over. Hi Ive just followed your advice and it seems to be working ok, Thanks. Not sure where the water is coming from though. Can you tell me please what are the two flexible pipes for just in front and above the water reservoir and should one end be open ? Hi David, unfortunately I’m not an engineer. I just had a go and wrote about what worked for me. I hope you get it sorted! Thank you very much. Instructions were perfect and easy to follow. Job took about 15 mins. Top class post. I flooded my dishwasher last week and thought it was hilarious seeing a kitchen full of soap bubbles until, after cleaning, I kept getting an error code. Thankfully I found this blog post via Google and managed to sort it out within half an hour. I had been panicking I was going to have a to call out an engineer so I am very relieved – cheers mate! The solution works! Thank you so much for the advice! Probably this is the very first time I’d like to thank for something on the internet. Your instructions and pictures are perfect & easy to understand. Not all hero’s wear capes. Thank you kind sir! I every usually comment either but this deserves one! You are amazing! Thanks so much for saving us calling someone out! Thankyou!!! Mark, Thank you very much. You saved me from calling a agent. Just followed your instruction and dishwasher is working without any triple blink and sound. Thank you so much for this! It’s worked for me and saved me calling someone out. Life saver!